Keeping with the theme of V12 Aston Martins this week after the unveiling of the Aston Martin Vanquish Zagato, we extend an offer to decorate your desktop with an older Aston surrounded by the most serene of landscapes. Could you just imagine this thing tearing down that empty road? At the speed limit, of course. This weekend’s wallpaper comes from Tim Morgan, and features a 2012 Aston Martin V12 Vantage nestled in the Valley of Fire in Nevada. The photographer is also the car owner for this particular wallpaper, and Tim said the “gorgeous pearlescent is called Morning Frost White and no photo, ever, can do it justice.” This one gets pretty close, at least. 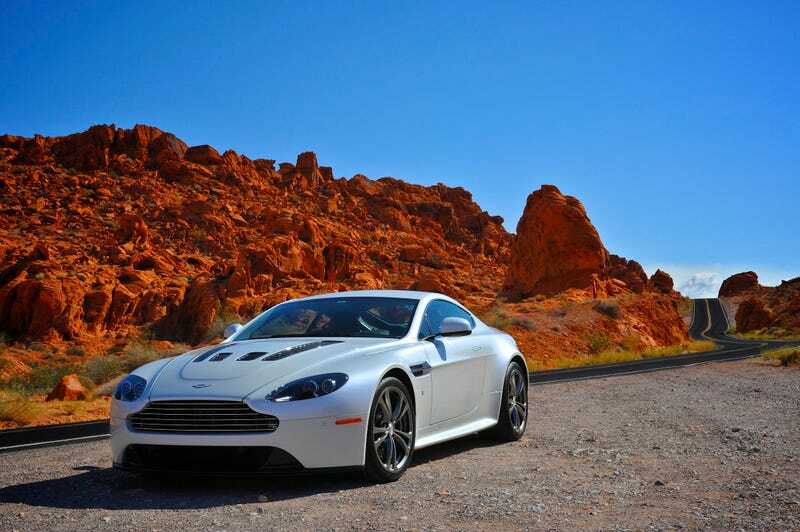 The 2012 Vantage made the Jalopnik list of best cars reviewed in 2013, slotting in at No. 2 and beaten only by the 2014 Chevrolet Corvette Stingray. We gave it a perfect score on exterior looks in its review, but the fiery backdrop in this photo somehow makes it even better looking than it already was. If you happen to have any photos—serene backdrop or not—you’d like to see featured as one of our weekend wallpapers, feel free to send an email to the address below. Photo credit: Tim Morgan. Used with permission. For a big desktop version, click here.